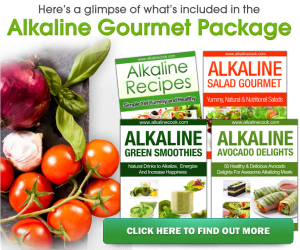 Alkaline Cookbooks & Recipes New Launch 2013! The main concept behind the pH miracle diet is to maintain a balance of pH in the foods that you eat. The human body is slightly alkaline and therefore it is better for your health to eat a diet composed of alkalizing foods. When you eat too many acidic foods, your system becomes unbalanced and it can cause a whole host of problems, including weight gain, poor concentration, fatigue and depressed immunity that can lead to more serious conditions. The pH miracle diet relies on lists of foods that are acidic (to be avoided) and alkalizing (to be emphasized). The alkalizing foods are better for your health and help to balance the pH of your body. While acid, alkaline and pH are common terms, many people do not understand exactly what they mean and what they have to do with nutrition and health. The word basic comes from the Greek word basis which means foundation. Basic relates to the properties of acidity and alkalinity. These conditions are determined at the foundation of the cells that the foods are made up of. So an external treatment does not change a food from acid to alkaline. Foods are acid or alkaline at their base, or foundation. Acid and alkaline are chemical opposites. Whenever these bases interact with acids, there is a struggle between them and salt is the result. In the chemists lab, these interactions are very simple and straightforward. However, in our bodies, the interaction becomes more complex because of the scale at which acids and bases meet. However, science can make some generalizations about the effects of acids and alkaline in the human digestion system. Acidic foods are acid forming in the human body. They make blood, lymph and saliva more acid and cause a lower pH number. Alkaline foods make blood, lymph and saliva more alkaline and cause a higher pH number. Just for reference, the normal range for saliva pH is between 7.3 and 7.4. Most people, however, are too acidic and have a pH that is much lower. They are burned out, tired and their bodies are starving for balance. Under the influence of acidic foods the muscles fatigue easily. You literally slow down because your body cannot produce the same physical results as before. The free radical oxidation that occurs when you eat acidic foods makes you age faster. Vitamins and minerals are not absorbed as readily. Friendly bacteria in the small intestine die, which puts the digestive system off balance. Further hurting the function of the intestine is the fact that a high level of acidity inhibits the ability for intestinal walls to absorb nutrients. Cells become stressed with the toxins that build up and cannot remove them. The vast majority of bodily systems cannot run at full capacity. On the other hand, alkaline foods have a wide variety of benefits to your health. Eating them improves your muscle output. They also have antioxidant effects in the body. They increase assimilation at the cellular level and allow cells to operate in the manner that they should. There is a reduction of parasites and yeast overgrowth with the use of alkaline foods. Alkaline foods promote deeper and more restful sleep, more youthful skin and relieve suffering from colds, headaches and the flu. Alkaline foods promote abundant physical energy. Perhaps the most important differences between acid and alkaline foods are their relationship to cancer. Cancerous tissues are acidic, and health tissues are alkaline. When oxygen enters an acidic solution it combines with hydrogen ions can form water. Oxygen helps to neutralize the acid, but acid prevents oxygen from reaching tissues where it is needed. When oxygen enters an alkaline solution, the two hydroxyl ions combine with the solution to create one water molecule and one oxygen atom. The sole oxygen atom is free to go to the next cell and bring the benefits of oxygen to all of the tissue in the body. At a pH of slightly above 7.4, cancer cells become dormant. Studies show that at pH 8.5, cancer cells die and healthy cells live. Alkalizing the diet has many benefits, in addition to cancer prevention. The alkaline food list is a selection of choices that will benefit your health when you start incorporating them into your body.